Here you will find the popular 'Traffic Light' system reflecting the status of the communications between the Air Tattoo and various military aircraft operators and their potential participation. Below will be a list of all the air arms and operators that have been invited to attend the Air Tattoo. A flashing light means the information has been updated within the past week. How do we invite participants to the show? We work with the RAF to produce the list of countries we will invite to the event and then extend that invitation to the respective nations' Chief of Air Staff. We follow up those formal invitations with a series of visits to their embassies in London, meeting with each nation's Military and Defence Attachés to discuss plans for the forthcoming show. Over the following months we receive official correspondence detailing whether nations are able to participate, if they will bring aircraft and whether those aircraft will be taking part in the flying display or whether they will be available for closer inspection within the RIAT static display. 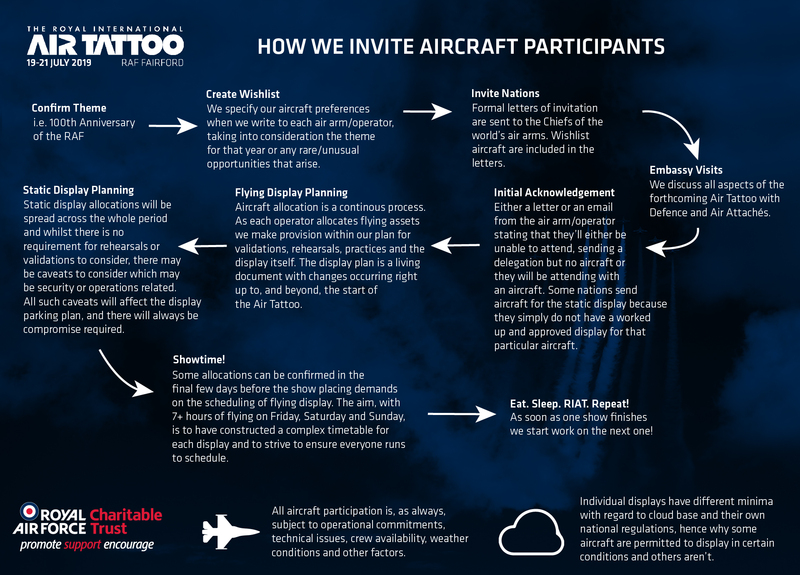 A range of national considerations dictate whether aircraft are made available for flying or static display at RIAT, the former driven by availability of a worked up and approved display for that particular aircraft type. The full list of nations invited to the 2019 Air Tattoo is below. You can read more about the process in this guide.